I checked out the Seattle Pinball Museum – hoping to play some Addams Family given that it’s been a long time since I’ve played this game – plus I wouldn’t think it possible for a museum to not include it. It was super popular and fun to play and was the best selling pinball game of all time. I was sure they’d have it. So did they? Yes, of course they did! I did not even have to wait much to play it. I visited in early afternoon on a Saturday. Parking around the area was a slight pain, but I managed to do some street parking without a meter that was only a block away from the museum. There are passes to enter once as well as day passes to exit and come back available. Drinks and light snacks are available, including beers. 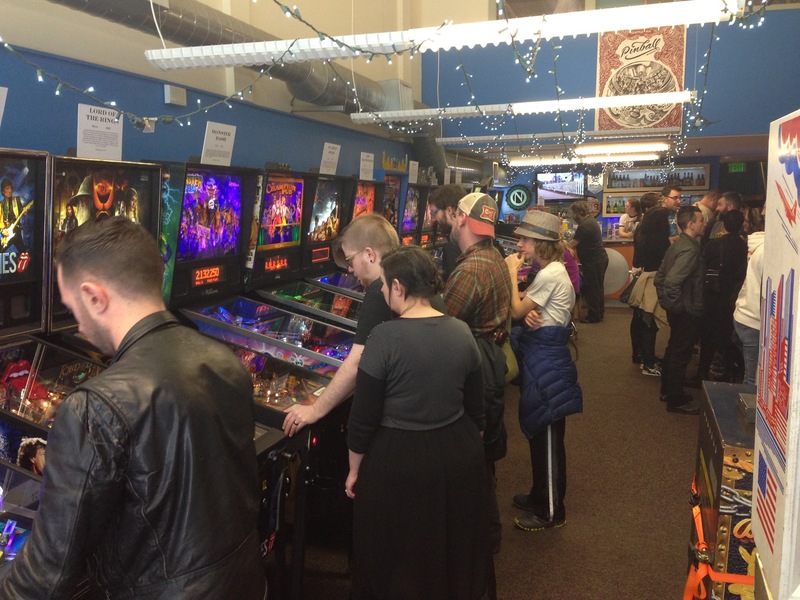 The building is fairly narrow but it’s packed well with pinball machines. These are quite expensive and valuable machines – although arcade games I grew up with can be had for relatively cheap, pinball machines have a lot of moving parts and associated maintenance – I know my favorite goes for $4-5k in good condition. I imagine this place is pretty well packed to capacity on a weekend evening. Most of the games have a notecard with a blurb on top about their history and development, as well as some kind of fun rating from some pinball organization. There are two floors and the museum starts out with oldest games on the right. I believe pinball manufacturing recently has dwindled quite a bit, although there were still a few new games there. It was cool and interesting to play some of the more classic pinball games from the 70s and such, although I still think the coolest ones were primarily those that came out in the 90s. Scattered about were a few classic arcade games as well. All the games were set on free to play, although they seemed to be experimenting a little bit with one. The Wizard of Oz game was set on pay to play, for a cost of $1. It appeared to be a newer game; I didn’t opt to try it although I did try most games in there. $1 is just too much for my brain, although at a quarter I would have given it a go. They also had some pretty recent games including 2013 and 2014 – the latter was actually an all video one. It apparently was loaded with 40 different games, although the one time I tried it I was unsure how to switch them and ended up playing a Star Wars themed game. Certainly this is cheaper than all the moving parts, although the reality was that it was really not all that satisfying. For decades now there have been pinball games available on computers and other gaming platforms – they don’t necessarily need to apply the rules of physics so they can do some cool things, although when it comes down to it I definitely preferred the real thing. I asked upon entry about my second favorite game – Twilight Zone – which I was told they did have, although was out for repair. Which was too bad, it was quite a fun game! A few other machines were not powered on – those I specifically remember were an AC/DC themed one as well as The Terminator. I did pretty well at Addams Family despite it being such a long time – my first 3 balls were all skill shots! It took me a little longer to earn my first multiball – I got it by my 4th game. I had a few more before I left the museum. I also got a good amount at some other games as well, I specifically remember getting it my first time playing Tales from the Crypt, as well as both times I played the Martians are Coming game. A couple others as well, although I don’t recall ever scoring one in some of the more classic pinball games. I’m unclear on what the etiquette is here – if I had a really sad/short game, I’d kick off another – after some play I would look around to see if anyone was lingering or waiting and quickly give up the machine after my last ball if it seemed so. It didn’t seem like I ever held anyone up, and I never had any trouble getting my hands on a machine I wanted to play. Even if waiting for a specific machine, others were available to fire up and knock some balls around anyway – so it was still fun and something to do, often on a machine I had never played before. I highly recommend checking the museum out, it was a lot of fun. The next time I’m in town again, I’m sure I’ll be taking another visit.